The trifectas continue to come and 39% today is a pleasing result. Sydney city winner Michelin Stars first foal by Turffontein has just completed 2 weeks of stable training after being broken in and has now been spelled for 4 months prior to its first racing campaign. The breeding business is long winded and plenty of patience is required however as the dams first foal prepares to race the waiting is hopefully worth it. Joe Pride commented that she had the same nasty streak as her mother but when she was asked to do some track work the head went down and she handled it well. Her dam Michelin Star was a gifted race horse with plenty of ability but cost herself more wins with her highly strung nature and tendency to work herself into a state before a race. 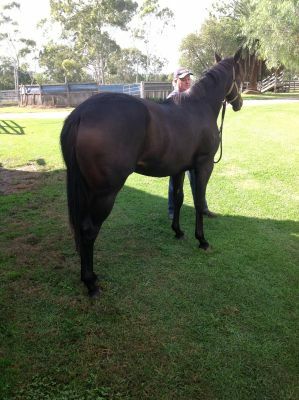 Looks like Kathy O'Hara will get a few more opportunities when this foal is ready to race. Michelin Stars second foal also by Turffontein is now a yearling and this year she foaled another filly to One More No More who is a cracker of a foal and a great looker. Trainer Robert Heathcote has been named a finalist in the 2013/14 Fred Hoysted Medal after his training efforts in October saw him net the third monthly nomination for the coveted trainers' title. It was a history-making month for the popular Queensland trainer who headed south for the Spring Racing Carnival where he claimed two Group 1 titles with stable stars Buffering and Solzhenitsyn, as well as a Group 2 title with talented mare Fire Up Fifi. Despite occurring later in the month, it was Buffering's victory in the feature sprint on Cox Plate eve, the $1 million Sportingbet Manikato Stakes (1200m) at Moonee Valley on October 25, which was perhaps the most memorable. The six-year-old gelding's narrow win saw the sprinter finally shed its tag of Group 1 bridesmaid after competing at the elite level on 17 previous occasions, and placing at 10 of these starts. Group 1 success quickly followed for Buffering, who claimed a second title in the VRC Sprint Classic (1200m) at Flemington on the final day of the Melbourne Cup Carnival on November 9, which sees the sprinter start TAB $2.40 favourite in Saturday's Group 1 Winterbottom Stakes at Ascot, Perth. Heathcote's training skills were also on display earlier in the month when miler Solzhenitsyn netted the Group 1 Toorak Handicap (1600m) at Caulfield on Caulfield Guineas Day, October 12, to mark the trainer's third ever Group 1 success. The third of his Spring Racing Carnival team, Fire Up Fifi, also competed successfully in Melbourne to claim the Group 2 Blazer Stakes (1410m) at Flemington on October 5. Heathcote received 18 votes for his training efforts to get the nod over Danny O'Brien (16 votes) who prepared maiden Shamus Award for the historic Group 1 Sportingbet Cox Plate victory at Moonee Valley on its feature Spring day, October 26. Back-to-back black type victories saw Cranbourne-based Robbie Laing (14 votes) noted for his efforts with emerging stayer Polanski, who, in a red-letter October came from midfield to win the Listed UCI Stakes at Flemington on October 5, before racing on pace to thrash his rivals by four lengths in the Group 3 Norman Robinson Stakes at Caulfield on October 19. Heathcote joins trainer Mick Price (September) and Mark Kavanagh (August) as finalists for the Fred Hoysted Medal, which is voted on by members of the Australian Trainers' Association and presented at the Scobie Breasley Medal night to recognise the outstanding Victorian training performance of the season. A new nominee will be announced at the conclusion of each month. We have had much better days. If you won your a genius! Todays best bet is PR6/9 Vitello at the odds available I thought "Amazing Value" for a class horse. Miss Rose Delago is a nice horse but backing up at short odds we will go Vitello's way. Big day at Morphetville 6 winners from 8 races and not many anywhere else. Trifectas were great as were first 4's with the highlight Doomben race 7 trifecta paying $963 and the first 4 $10,652. Looks like a pretty good days racing with the Perth Carnival heading for a big Super Saturday next week. Best Each Way in Perth is PR6/9 Western Gem who needs to run 1 or 2 to make next weeks Guineas field. Great day to be at Flemington and looks like a Dead 4 rating will be retained. Interestingly 2 of the last 3 Emirates winners came out of thier previous run being in the Cox Plate so we will be having a little spec bet on Mull of Killough at $51 the only runner that fits that bill. We expect a match race between Sacred Falls and Toydini and favouring Sacred Falls. Lucky Nine looks the best in the VRC sprint classic but has got the drifts. Only 3 meetings today Flemington, Randwick and Ascot. This years Cup shapes as a race full of class and impossible form lines so I will be very happy if we can find the winner. Really found it tough to split Voleuse De Couers and Dear Demi as form lines are completely out of line however if you back either horse each way you should find a nice result. Any horse that can win a G! St Leger by 6 lengths only has to bring that form to town and win the Cup. Dear Demi on the other hand is rock hard fit and drops back to 51kgs after a top effort inThe McKinnon carrying 56.5kg but the downside is the barrier draw and it gets back so will need a top ride from Chris Munce to get the chocolates. Specials on Melbourne Cup day are always hard to find with many long shots finding the line historically. Magic Days racing as always. We stick with Compacent in the Deby even with its shocking draw and Savvy Nature and Polanski pick themselves for second and third. I cant see a 100/1 bolter upsetting the party today but then I think back to the Cox Plate? Plenty of value around in our other bets today but it doesnt matter how you go about the punt , just watching todays racing will be a pleasure.